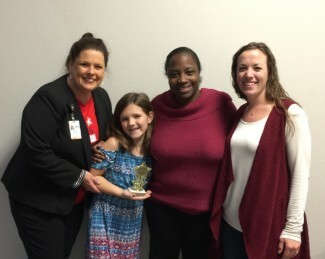 Madison Doss has been chosen from Nancy Neal Elementary based on the virtues of outstanding character, citizenship, fairness, honesty, kindness, respect, responsibility and trustworthiness. Below is a picture of Mrs. Ferrell (Nancy Neal Elementary, Assistant Principal), Madison, Mrs. Patton (Nancy Neal Elementary, Principal) and Mrs. Ketcher, Madison's 3rd grade teacher. Congratulations Madison!